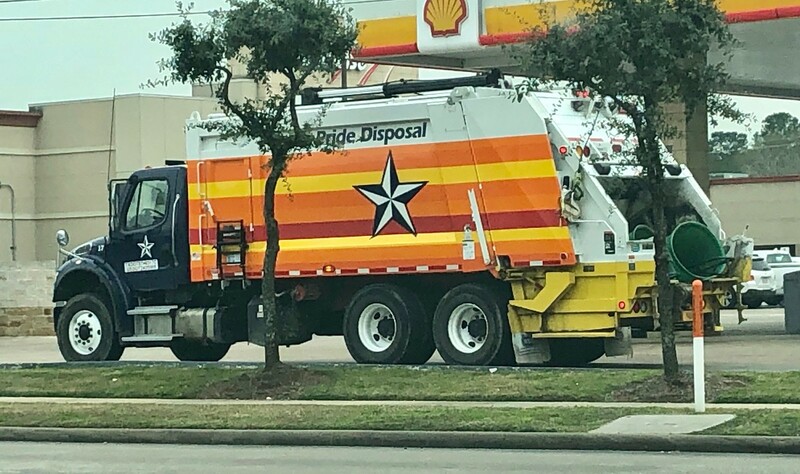 Uni Watch reader Tyler Evans recently spotted something very interesting on the streets of Houston: a tequila sunrise-themed garbage truck! I was intrigued, so I asked him if this was the first time he’d seen it. Did the trash-collection company have a whole fleet of tequila sunrise trucks? Tyler said he’d lived in Houston his entire life but hadn’t seen the truck until that day. As you can see above, the company’s full name was obscured by a tree, so I googled “pride disposal houston” and found myself at the website for Texas Pride Disposal, which is headquartered just outside of Houston. The star graphic on the website matched the one shown on the truck, so this was definitely the right company. Growing up, for as long as anyone who knows me can remember, I have always wanted to be a garbage man. Whether it was riding my bike up and down the street with the regular crew, owning an entire fleet of toy garbage trucks, or even having a few goldfish named BFI [for the garbage company Browning-Ferris Industries], garbage has been my passion for quite literally my entire life. As I grew up, the toy trucks were retired, but the real trucks continued to catch my eye. After returning home from my freshman year of college, I was hired as a helper for a local company. I spent the entire summer throwing trash on the back of the truck, the hardest job I’ve ever had. … After graduating, I was hired full-time, and quickly became an operations manager. Within a year, I was managing the residential division for the entire Houston market, an operation that consisted of over 300 employees, 200,000 customers, and 80 trucks. So here I am today … more passionate about what I do than anyone you will ever meet, and ready and excited to go above and beyond for you and your community. Uni Watch: Which truck came first — Astros or LSU? UW: When would this have been? KA: When we first started, in 2013. I think it was about two and a half years later, we’d sold 20 trucks’ worth of business. It was time to order truck No. 21, and I said, “Hey, you said I could do this.” He said, “Have at it,” so I called my truck guy, told him what I wanted to do. He loved the idea and sent me a mock-up. It had a standard white cab and a white body with a purple logo. And I said, “No, that’s terrible. I want this to be the most obnoxious truck you guys have ever designed, ever.” So he came back with this full-blown purple and gold design. It’s got purple underglow lights that you can’t see in the photos. So we did that, and it got a lot of attention. And for something LSU-related, being in Houston, it was something of novelty. UW: Yeah, I was going to say, it’s sort of like putting the truck in enemy territory. KA: Yeah, this is Aggie country, for sure. My business partner was a little concerned that we’d have, like, people throwing tomatoes at us. UW: They’d throw garbage at a garbage truck! KA: Right, exactly! But it was popular, and a lot of fun. UW: Have you ever taken it to an LSU game? KA: LSU played in the Texas Bowl at NRG Stadium here in Houston in 2015. I wanted to bring it on the field and have it parked in the corner or something like that, but it didn’t work out. If LSU ever plays here again, I’d probably bring the truck out to a tailgate. That’d be a lot of fun. UW: Would you consider driving it to a game in Louisiana? KA: No, I wouldn’t take it that far. UW: Do the people at LSU know about you and your truck? KA: The Houston LSU Alumni Association definitely knows. The very first day I picked up the truck, I drove it straight to the alumni association’s annual crawfish boil, which was taking place that day. So it was parked there. There were all these kids crawling around in it. It was a really cool experience. UW: And what about the Astros truck — how did that come about? KA: After [Hurricane] Harvey came through in 2017, and then the Astros winning the World Series, there was this spirit that grew throughout the whole city. At one point I was sitting in a bar with my girlfriend and I was drinking this beer that had the Astros’ retro jersey design on their can. So I was looking at the can and I was like, “This would be a fantastic truck wrap.” So I took a photo of it, and got a photo of the rainbow uniforms, and told my truck guy that I wanted to do that. So it’s an Astros truck, but it’s also a Houston truck. It embodies the pride and perseverance that people here had after Harvey, and it embodies how the Astros turned their franchise around from being a bad team to World Series champions, and it also embodies our company’s spirit, because we had some setbacks early on, including a terrible fire that burned four of our trucks. So this truck has a lot of meaning to us. UW: Do you prefer that uniform to the Astros’ current uniform? Do you wish they’d go back to it full-time? KA: I like the current uniform. But those rainbow jerseys were so unique. UW: How have people reacted to the Astros truck? KA: It’s gotten way more attention than the LSU truck — which makes sense, since it’s Houston. At one point we brought it to the Minute Maid Park parking lot and took photos of it with the ballpark in the background. UW: Have you been in touch with the Astros, or have they been in touch with you? KA: We kind of teased the truck on Instagram, and we tagged lots of players in those photos. But no, I haven’t actually heard from anyone connected to the team. UW: Were you concerned about trademark issues, or using their design without getting permission? KA: The way we look at it, it’s really just a color scheme. And the star on the truck is not the same star they use. So we just kinda went with it. UW: You mentioned that there was that beer that also had the rainbow theme as part of the can design. Are there lots of businesses in Houston that use that pattern on their signs, or their vehicles, or their package designs, or whatever? KA: Yeah, I’d say it’s one of the more popular designs. Off the top of my head, I can’t think of any other examples, but I do feel like you see it around town. UW: For these specialized truck designs, is that a paint job, or a vinyl wrap, or what? KA: It’s a vinyl wrap for both of them. Actually, for the LSU truck, they painted it purple for the base, but all the gold was a wrap. UW: Do you have any other sports-themed trucks, and do you plan to have more of them? What about a Houston Rockets truck, or a Houston Texans truck? KA: We’ve talked about it, and it would definitely be fun to have a whole family of sports trucks. But I think it would be tough without pushing the copyright or trademark issue, because for those other teams you can’t really do a color scheme — you’d need to use the team logo, and that’s a lot harder to do without consent from the team. We haven’t gotten there yet. And there you have it. Let’s hear it for Kevin Atkinson, who’s achieved his lifelong dream and put a uni-related spin on it to boot. Something you don’t see every day: I’ve always said I’m not particularly interested in fans wearing overpriced polyester shirts. But I never said anything about chainmail shirts. That’s what a Devils fan appears to have been wearing during Tuesday night’s Devils/Blue Jackets game in Columbus. I’m pretty sure I’ve never seen anything like that before. Is this a new category of retail merch? Where there’s a Wilson, there’s a way: I was channel-surfing last night and ended up watching part of Cast Away — my first time watching it since it came out in 2000, I’m pretty sure. Naturally, I found myself thinking about the volleyball, Wilson. When the movie came out, I remember reading about how it was such a plum product placement for Wilson Sporting Goods (which ended up capitalizing handsomely). But if you were making this film today, would you still use a Wilson product? 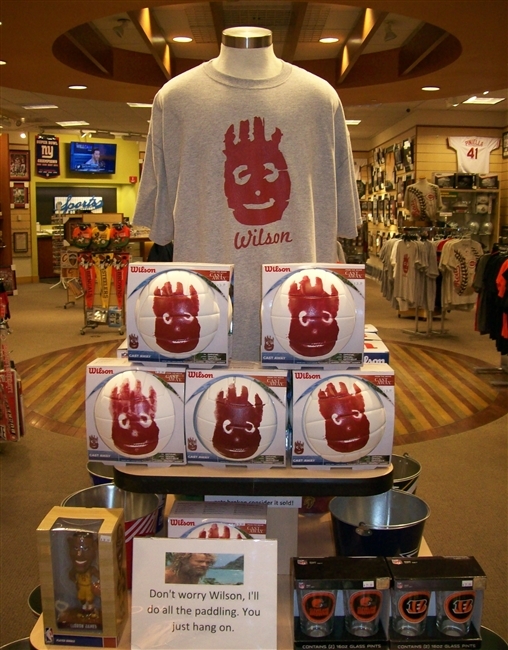 In the late 1990s, when Cast Away was being made, Wilson was a pretty major sporting goods operation. (As late as 1997, they made the uniforms for six NFL teams.) Two decades later, Wilson — like Spalding, Rawlings, Champion, and the other legacy sporting goods companies — now seems like a relic from another era. They still make the official NFL football, but that almost seems quaint. Wilson and the other legacy operations were in the sporting goods business; the companies that have eclipsed them — Nike, Under Armour, Adidas — are in the lifestyle business. It’s a different world. Hollywood, of course, is also in the lifestyle business. If you were making Cast Away today, you wouldn’t want the movie’s key supporting role to be played by a stodgy old brand like Wilson, right? You’d want Nike or Under Armour. Then again, Wilson makes for a much better character name, so maybe you’d still use a Wilson product after all. Still, it’s good food for thought. 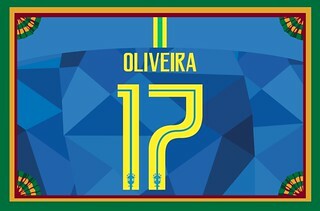 Membership update: A bunch of new designs have been added to the membership card gallery, including Kevin Oliveira’s card, shown at right, which is based on the Brazilian national team’s jersey. Card designer Scott M.X. Turner did a great job with this one, no? I have three slots open in the current batch. So the next three people who sign up will get their cards pretty quickly. Ordering a membership card is a good way to support Uni Watch (which, quite frankly, could use your support these days). And remember, a Uni Watch membership card entitles you to a 15% discount on any of the merchandise in our Teespring shop. (If you’re an existing member and would like to have the discount code, email me.) As always, you can sign up for your own custom-designed card here, you can see all the cards we’ve designed so far here, and you can see how we produce the cards here. ’Skins Watch: During a recent NLL game between the Philadelphia Wings and the Georgia Swarm, the Wings’ PA announcer suggested that everyone should “snip the pony tail” from Swarm player Lyle Thompson, who’s Native American. Fans also suggested scalping him. 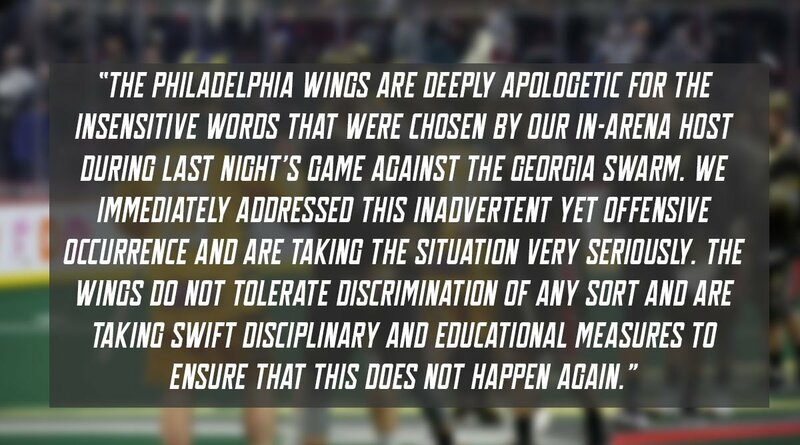 The Wings later issued an apology, as did the PA announcer himself, who was then fired (from @PhillyPartTwo). Baseball News: Back in the 1970s, a baseball card collector and photography enthusiast got the idea of making a set of trading cards featuring famous photographers posing in baseball gear (great find by Paul Friedmann). 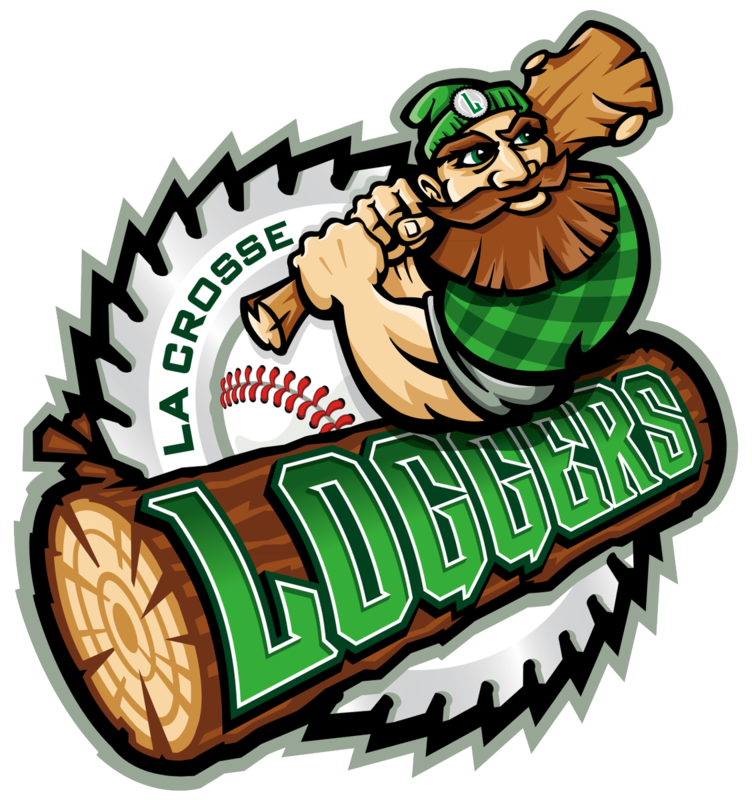 … Yesterday’s Ticker showed the new La Crosse Loggers logo. 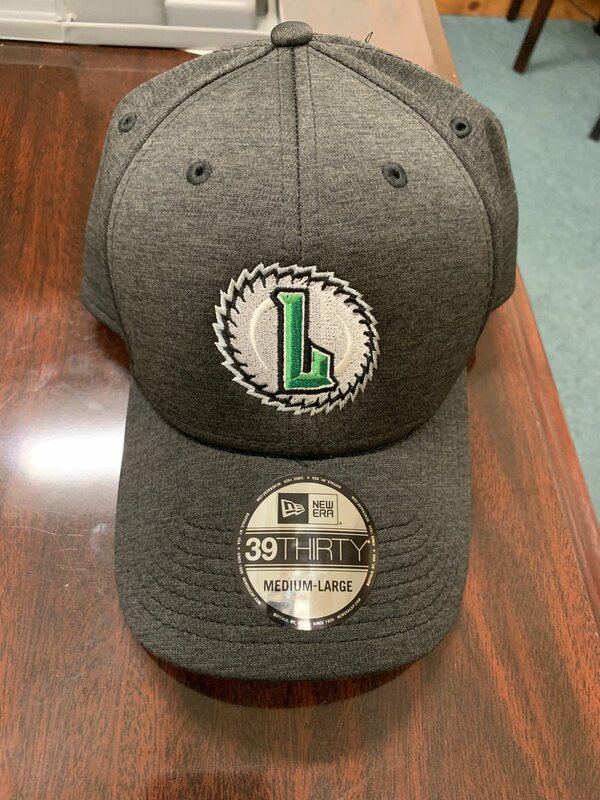 Here’s their new cap. … Charlotte Knights skipper Mark Grudzielanek’s nameplate extended all the way to his sleeves — and the “G” extended beyond the nameplate! Never seen anything like that before (from Mark Springer). … The new logo for the PGA Tour’s Houston Open has an Astros-style tequila sunrise theme. … Newly acquired Mets INF Jed Lowrie, who wore No. 8 with the A’s, will wear No. 4 for the Amazin’s. He previously wore that number while playing for the Astros in 2012. 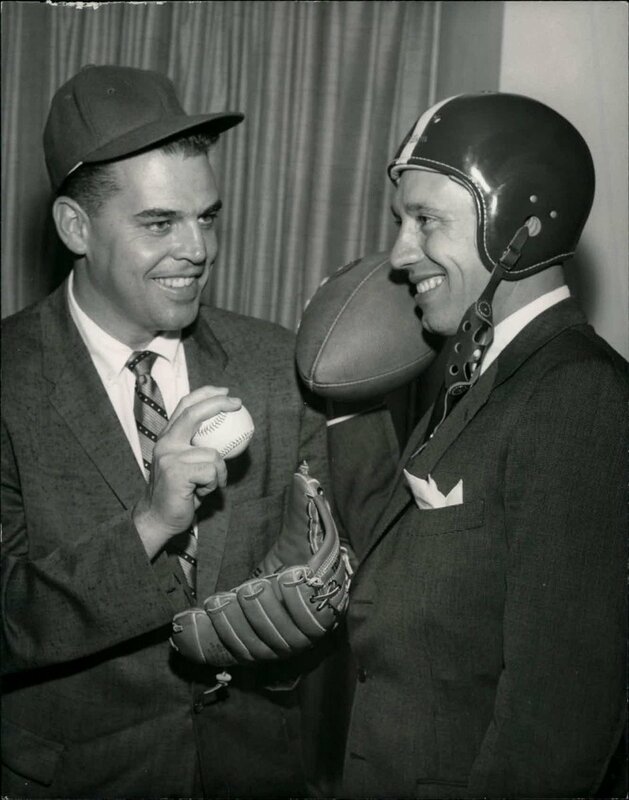 … Love this old shot of fireballer Bob Feller and football great Otto Graham trading equipment (from @cDud1970). Football News: Although there’s been no official announcement, this year’s Pro Bowl uniforms are apparently the same as last year’s. … Cross-listed from the baseball section: Love this old shot of baseball great Bob Feller and QB Otto Graham trading equipment (from @cDud1970). … Falcons P John James wore a foot-warmer while standing on the sidelines during a 1978 playoff game against the Eagles (from Mike Selock). … Here’s a weird one: Some runway models at a fashion show in Paris wore Chargers and Longhorns football helmets. Additional info here and here (from @_STODD and Phil). … New Oregon recruit Kayvon Thibodeaux says the team’s uniforms had nothing to do with his school choice (from Lendsey Thomson). Hockey News: “Stick It to Cancer” uniforms tomorrow for the Greenville Swamp Rabbits. … One-game food-based team makeovers, already popular in baseball, are catching on in hockey. Case in point: The Maine Mariners will become the Wild Blueberries on March 9. … Here’s a photo gallery of Northern Ontario Junior teams wearing throwbacks. … The Flames are expected to announce the retirement of Jarome Iginla’s No. 12. It would be only the third number retirement for Calgary, following Mike Vernon’s No. 30 and Lanny McDonald’s No. 9. … NASCAR driver Erik Jones visited a Red Wings practice on Tuesday. They gave him a No. 20 Wings jersey (Jones drives the No. 20 car for Joe Gibbs Racing) and he gave autographed racing helmets to several Wings players. … Golden Knights G Marc-Andre Fleury got caught building a snow wall in front of his soon-to-be-empty net on Tuesday night. … Here are some really nice 1932 photos showing hockey teams from Michigan’s Upper Peninsula. Really nice uniforms (big thanks to Benji Hainault). … The AHL All-Star jerseys have been unveiled (from Kristopher Sharpe). NBA News: NBA players’ feet take a beating, so many of them are getting pedicures (WaPo link). … The D League’s Grand Rapids Drive will wear Flint Tropics jerseys uniforms tomorrow. … Logan High School in Utah wore the Jazz’s red rock uniforms last night (from @macpm15). … Rockets G James Nunnally’s uni number looked badly off-center last night. College and High School Hoops News: New BFBS uniforms for the Iowa State women’s team (from Sean Jankowski). 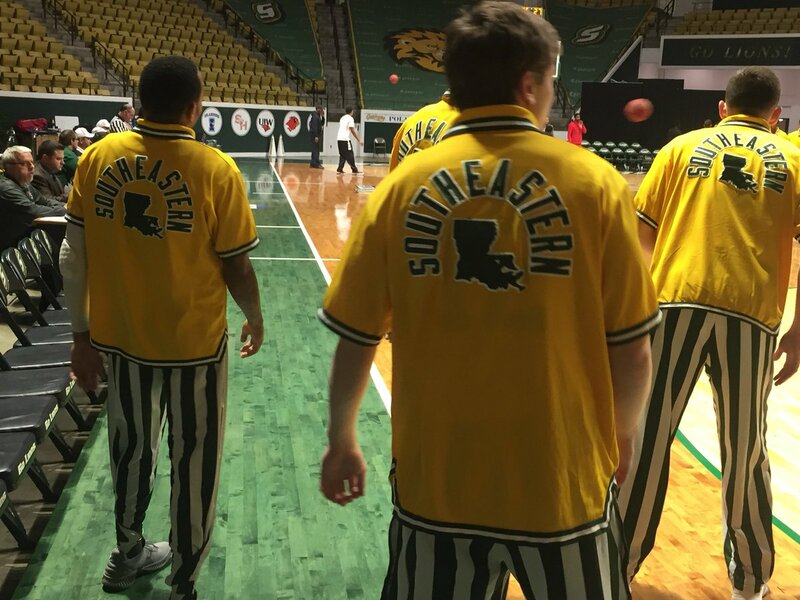 … Awesome throwback warmups last night for Southeastern Louisiana (from @EddieScissons). … Cross-listed from the NBA section: Logan High School in Utah wore the Utah Jazz’s red rock uniforms last night (from @macpm15). 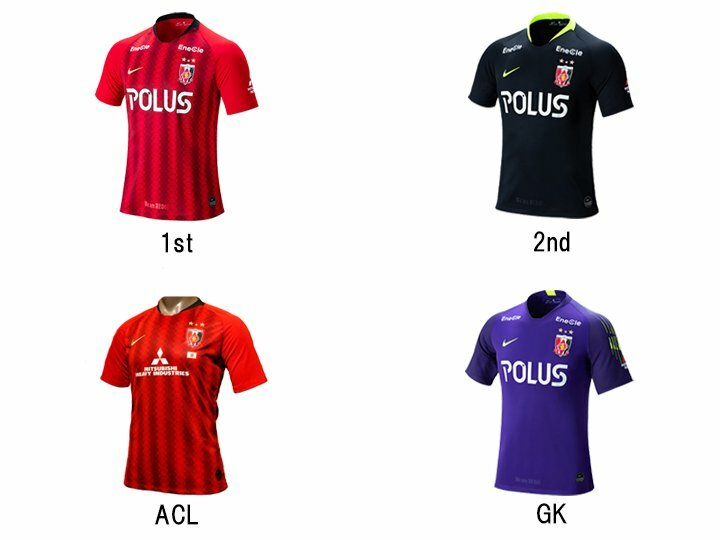 Soccer News: New shirts for the Urawa Reds (from Ed Zelaski). … Many players on the Chinese national team have been wearing long-sleeved undershirts, even in stiflingly hot weather, because of the country’s sports officials have banned visible tattoos (NYT link). 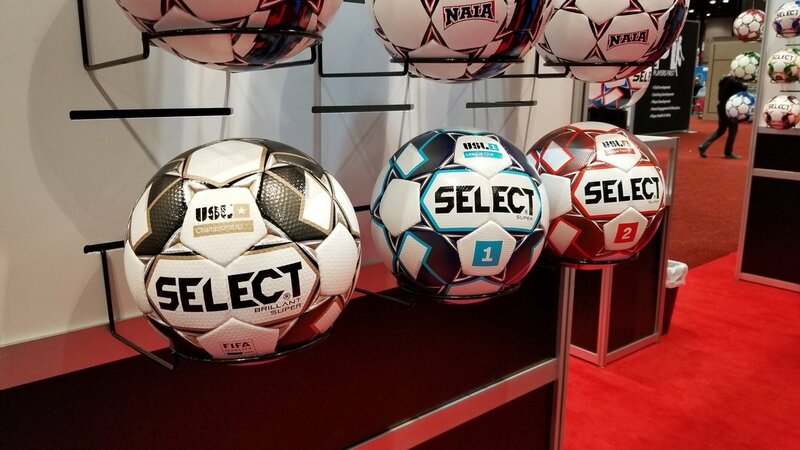 … Here’s a closer look at the match ball for the USL Championship (formerly the USL, and the current second tier of USA soccer), the new league USL League One (USA 3rd tier), and USL League Two (formerly the PDL, and the current fourth tier of USA soccer) (from Josh Hinton). … English League One team Scunthorpe United is having a poll to choose next season’s kits (from our own Jamie Rathjen). … And so it has come to this: The Seattle Sounders are doing a countdown clock to hype the announcement of their new jersey sponsor advertiser. … New away kit for Venezuela (from Ed Zelaski). Grab Bag: Interesting piece about modern chefs’ attire. Key quote: “The exact origins of the classic chef’s uniform are murky. Amy Trubek, a professor at the University of Vermont, said the outfits were white, like the uniforms of many other professions in the 1800s, because they represented ‘the 19th-century idea of purity, sanitation and cleanliness.’” … The Chinese smartphone brand OnePlus will become the jersey advertiser for the esports organization Fnatic. … Cross-listed from the baseball section: The new logo for the PGA Tour’s Houston Open has a Houston Astros-style tequila sunrise theme. … Speaking of the PGA, golfer Bryson Dechambeau carries a yardage book personalized with his initials — but the period after his last initial is missing (good spot by Jerry Kulig). … Cross-listed from the hockey section: NASCAR driver Erik Jones visited a Detroit Red Wings practice on Tuesday. They gave him a No. 20 Wings jersey (Jones drives the No. 20 car for Joe Gibbs Racing) and he gave autographed racing helmets to several Wings players. … New logo for Slack. Additional info here (from Eric Bangeman and our own Brinke Guthrie). 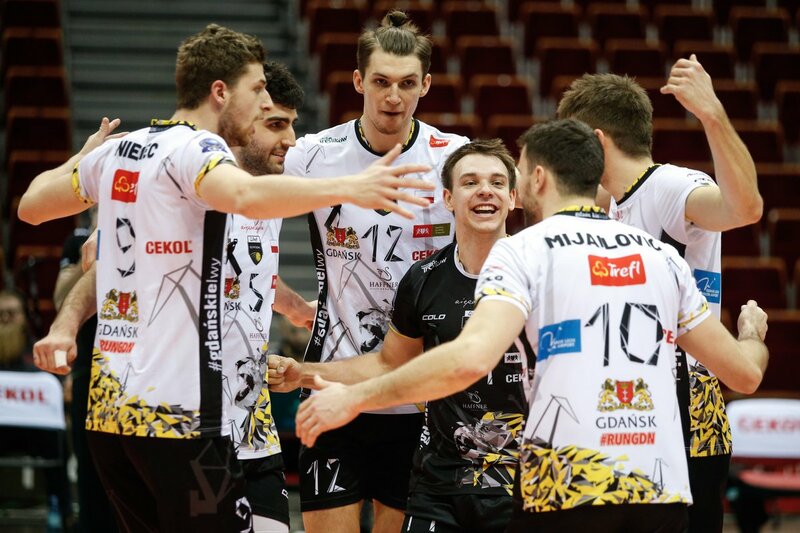 … The Polish men’s volleyball club team Trefl Gdańsk has a bizarre number font (from Jeremy Brahm). If what you say holds true, then I’ll be one very happy graphics (for GUD) guy for the next 365 days. Absolutely dread the reveal of the Pro Bowl uniforms each year. Nice to be able to ‘take a year off’ and pretty much recycle last year’s versions! 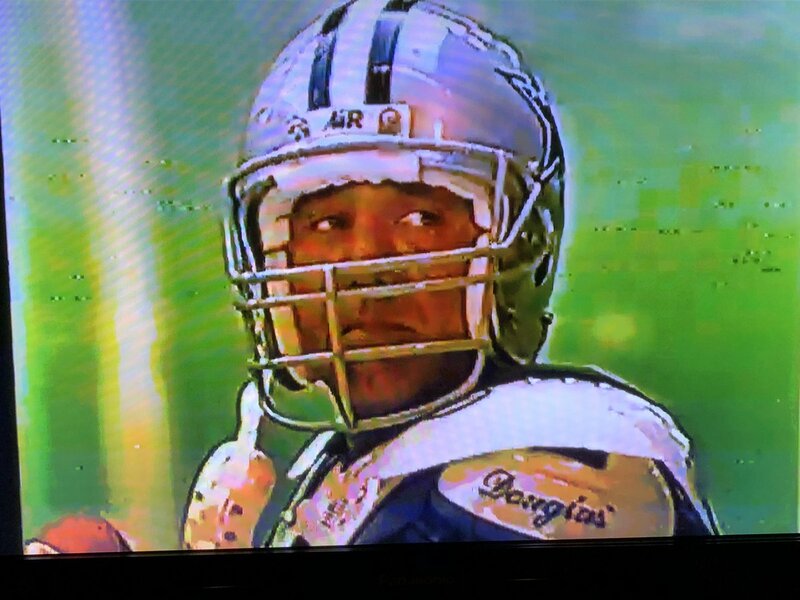 Bill, do you mean that the Pro Bowl uniforms are difficult for you to render, or that they’re so ugly that you hate having to render them? Coding error. Should be fixed now. I believe Spindletap also has Rockets and Oilers-inspired can art as well (and maybe additional Astros designs as well). I’ve only seen photos, as I’m not local to the area. PROOFREADING: The Eric Jones/Red Wings item is incomplete in hockey (but complete in grab bag), and there’s something about the Flames before it that never gets going. Cast Away star Tom Hanks’ wife is Rita WILSON, so the volleyball was named after the brand AND Tom’s spouse. I love today’s entry. Working in the environmental and waste services industry this put a giant smile on my face. Now if only I could get my company to have such a great wrap on our trucks. I love today’s entry too! Great intersection between sports logos, popular culture, basic infrastructure, community ethics, and small business. At this point, any evidence of economic sectors where a local businesses can enter the market, compete, and grow is a good-news story for me. I love the passion he has for trash. Someone “has to do it,” but he has a passion. I admire that. I wish American leagues would adopt a no visible tattoos rule. It’s getting harder and harder to watch sports. That’s ridiculous and wouldn’t hold up legally for 5 seconds. The main issue would be that this would come across as racially coded. That’s a really unnecessary and inflammatory response, Sam. For starters, you don’t know Stevie’s race. More importantly, there are lots of tattooed athletes of *all* races. Absolutely zero reason to go down that road on this topic, so let’s not do so. Thanks. This isn’t about Stevie’s opinion, which he is entitled to, this is about the likely effect of enacting this rule, and that’s not even my opinion I’m stating. If a professional sports league in the United States attempted to ban tattoos at all levels, there absolutely would be an uproar about controversy about racial coding in the rules, just as a league attempting to ban dreadlocks would be, even if some white stoners also like wearing dreads. If you don’t want to “go down this road further” that’s fine but this is a website that had an entire blog and discussion about whether it was “white” re: the Atlanta Hawks uniforms, and another post about whether or not black people litter their cigarette packets more than white people do, so I wasn’t under the impression that this was a taboo subject here. Absurd comparison. There are no white stoner dreadlocked athletes. But there are LOTS of visibly tattooed white athletes. (If you’re not aware of this, I take it you’re not a baseball fan.) A ban on tattoos, whatever its other merits, would affect countless athletes of all races. There is no reason to project a racial framework onto the discussion. Race is a perfectly valid topic to bring up on Uni Watch — when it’s relevant to the discussion at hand. But it is not relevant to this discussion, for reasons I’ve just explained. This topic is done. Let’s move on. Thanks. Tattoos make it hard to watch sports? That’s an interesting take. And you would think that someone who reads Paul’s thoughts and writings here would be just a tad bit more open-minded. Stevie’s comment at the top of this thread, whether you agree with it or not, is a straightforward opinion on athletics aesthetics. He’s saying that tattoos detract from his aesthetic enjoyment of the game. That is exactly the type of opinion that’s welcome here on Uni Watch. To say, “Tattoos make it hard to watch sports? That’s an interesting take” is no different than saying, “Uniforms make it hard to watch sports? That’s an interesting take.” You don’t have to agree with Stevie’s opinion, but dismissing his statement out of hand is a sign of someone who Doesn’t Get It™. Instead of ridiculing Stevie for having an opinion, why not debate his opinion on its merits? Whether he thinks tattoos make it “hard to watch sports” is certainly a valid opinion. But saying the leagues should adopt a rule against them is way overboard and can’t see how that can be debated. I don’t know. The Yankees have a rule against beards and long hair. Until very recently, the military had a tattoo ban. Lots of professions have dress codes. It all seems well within the realm of reasonable debate. Great take Paul. Having a few tattoos (though they cannot be seen unless I am at the beach or otherwise shirtless) I have no problem with tattoos. But from a sports aesthetics perspective, especially if you really like everyone to appear uniform in their appearance, I could see where it would become distracting. Certainly ugly uniforms make games a little less enjoyable to watch for me, so I wouldn’t completely dismiss this guy’s take. And just because I fully support the right for someone to tattoo their entire body doesn’t mean I necessarily find that appearance enjoyable to look at. Likewise dress codes are a completely acceptable part of society, and I think it is sad we are slowly abandoning them. But what happens if someone gets a tattoo on their forearm when they’re 18 or so? Would they never be allowed to compete in a major sports league because of it? Cover-up cream. Compression sleeve. Wristband. Long-sleeved undershirts like the Chinese soccer players in the Ticker item that started this whole discussion. Etc. I’m not saying those are great options, but it’s not the same as NO options. Dismissive? I simply stated it was an interesting take. Is it not an interesting take? Sure, he can extrapolate on it. But, can’t it just be interesting without being ridiculing? I interpreted your use of “interesting” as a dry, sarcastic way of being pejorative. If I was wrong about that, I apologize. But the underlying point remains: In the context of Uni Watch, objecting to tattoos is no more “interesting” (in either the literal or sarcastic sense) than objecting to an unsightly uniform. I have no problem with tattoos, but when I watch clips of NBA games from the 80’s or prior, the total lack of them is the first thing I notice. At this point, it would be kinda weird to see 2 whole teams with players that don’t have tattoos. I don’t mind tattoos at all, and while I understand they aren’t everyone else’s cup of tea, it never occurred to me that someone would opine that they make games more difficult to watch. Now if we’re going to talk about something that makes games harder to watch, let’s talk about how so many players wear their socks! I guess I don’t notice the lack of tattoos. The first thing I notice about video/photos of the NBA pre-90s is how skinny everyone is. Even the big guys like Chamberlain and Russell have very little muscle tone to them. Now almost every player looks like a bodybuilder. I do agree with Stevie that seeing someone like Chris Anderson does take away from the aesthetic appeal of a game. Stevie said he “wished the American leagues would adopt a no visible tattoos rule”. I think he knows he could never realistically happen. Stevie said he “wished the American leagues would adopt a no visible tattoos rule”. I think he knows he could never realistically happen. I get the feeling that a lot of people participating in this thread did not read the soccer section of today’s Ticker, which includes an item about Chinese soccer players wearing long-sleeved undershirts because they’re not allowed to have visible tats. That’s what Stevie’s comment was referencing. He didn’t just come out of the blue and make some crazy statement about banning tattoos — he was reacting to something in the Ticker. First guy I ever remember seeing with a tattoo playing basketball was Houston’s Larry Micheaux in the mid 80s. Socially and culturally, it’s remarkable how commonplace they have become in the world of sports and society in general. As a fan and viewer, I find them distracting, especially in sports like basketball where skin is much more visible. To each his own, but like hemlines and hairstyles, styles change, so I wonder if — when — we’ll see ink become passe among athletes (“that’s SO older generation”), leading to a return of unmarked skin. Good topic to discuss. -C.
Tattoo shops weren’t even allowed in Massachusetts until 15-20 years ago; before then, you had to cross into Connecticut to get them, I believe. Certainly it’s been quite the cultural shift. Tattoos were also banned in NYC, of all places, from the 1960s until 1997, due to a hepatitis scare. I got my first tattoo from an underground guy in 1992, when they were still illegal. Loved this garbage truck story! Thanks for all the work you do. Does this mean we will soon see baseball jerseys designed to salute the garbage and sanitation industry? Possibly designed to look like a trash heap or landfill? Good one! I should have thought of that when interviewing Atkinson!! As an alumnus and lifelong fan of LSU and a lifelong fan of the Astros who has lived in Louisiana almost his entire life, I loved this garbage truck story! Thanks for writing it. Stick it to Cancer? Wow! Who isn’t against Cancer? Hands? Another example of beating a promotional dead horse with “special shirts” to associate your product with a cause without having to donate actual time or money to it. Eeesh. However, I want to be fair when I point out shameless brand awareness programs, I’m nice like that. So let’s review the goals of “marketing” a brand awareness campaign shall we? It’s supposed to do two things. 2) bring more awareness to this ___________________ (insert terrible disease, disaster, death de jour). This makes sense to a degree, but it is only part of a successful marketing campaign. The goal of any marketer is to increase sales by promoting the product so that consumers KNOW, TRUST and LIKE a product. I swear by my Big Mouse marketing school training this is true. You know awareness isn’t the same as affinity or likeability. Right? You know who also has great awareness? Donald Trump, and Mr. Uber-Buber himself Travis Kalanick. They’ve both found themselves in the headlines — but does mean you’re going to be doing business with them? As a consumer, you’re aware of hundreds of brands that you have no opinion about. Or just don’t like. Or bought once and would never buy again (like those #35 Yankee jerseys). Brand awareness isn’t that hard to achieve. You can get it with a big budget, bigly huge surprises for shock value or simple longevity. But if you believe the adage that people buy from those they know, like and trust, then awareness only gets you the “know.” “Like” and “trust” are other things entirely and require a real understanding of your target audience and what inspires them to action. That is why Madison Avenue types charge outrageous sums for the campaigns they conjure up to connect the “like” and “trust” parts to their products. Brand awareness programs are wildly popular in the sports marketing biz because they are viewed as the most cost effective (cheapest) way to associate your product market to your audience. They are becoming irrelevant due to overuse. I will ad that it’s interesting to me that cancer has gone from being a disease that we want to see treated/cured/prevented to an “enemy” that we want to “fight” and “defeat”. I meant “add”, of course. Freudian slip? It’s a misnomer. Several leagues claim they are fourth tier, but no fourth tier “actually” exists. US Soccer only identifies three divisions (tiers). All other leagues that are not designated in division 1, 2, or 3 are simply just amateur divisions/leagues. Leagues or teams that designate themselves as fourth tier are typically searching for relevancy. They feel as if labeling themselves something will give them more value. Similarly to independent baseball being referred to as “minor league” when they are truly “independent” not the official MiLB. I work in the League. Nowhere is that EVER stated, talked about, or even inferred by League officials. Find where USL would call itself “fourth tier.” It won’t happen, and it doesn’t matter what MLS labels it as they aren’t the governing body. Like I mentioned, those that dub it as “fourth tier” are trying to place it in a “relevancy” column for people that do not know. Or, they are trying to garner support by labeling it “semi-pro” (which is often done). Neither are correct. I think this has been mentioned here before, but there are/were cement trucks in the PA/DE area that were sports branded with, iirc, Notre Dame & Villanova logos. In Lexington, Kentucky, there are several garbage/recycling trucks with the old Lexington Legends mascot and logo on them. Not sure how Tom Hanks could anthropomorphize a modern day volleyball. Molten and Mikasa dominate the college/professional volleyball market. Both brands also have multi-colored panel construction. I think Wilson is still the official beach volleyball for the AVP, but it’s also not plain white. Very interesting ledes this week, Paul! Thanks, Josh. It’s been a fun week! “…garbage has been my passion for quite literally my entire life.” That is awesome. Never knew a poo diver would have such passion for poo. Okay, we have a Wild Blueberries. It would be complementary if we can have the Marlies, Belleville, or Laval dress up in maple syrup jerseys. Obvious because they are wild. Maybe? Here’s the link to the photo in question. I hope you get this. Let me know what you think. I live in Houston, and have for 33 years. The upper Gulf Coast of Texas — Beaumont/Port Arthur to Brazoria County, including metro Houston — owes as much of its cultural identity to Louisiana as to Texas. There are a lot of UT and A&M supporters here, but LSU fans are prominent. A local writer, John Nova Lomax, argues that “Houston is not of Texas. It is really the capital of Greater Louisiana.” A lot of us agree with him. A “Geaux Tigers” garbage truck is perfect for this town. Great lede today…it’s stories like this that are worth the price of a membership card! Reminds me a bit of Rev. Dr. King’s “street sweeper” speech. Kevin Atkinson seems called to be a garbage man, and whether or not he’s the best garbage man he can be, his trucks are certainly the best looking. Never seen that before, only with barefoot kickers/punters. I don’t have tattoos but I’d wear them (or a long sleeved jersey like David Beckham) to keep the sun off my arms. With the materials they use now, wearing long sleeves won’t make you feel any hotter. Why is soccer (just about) the only sport where they keep changing the ball design? Just. Stick. With. The. Standard. Telstar. Ball. 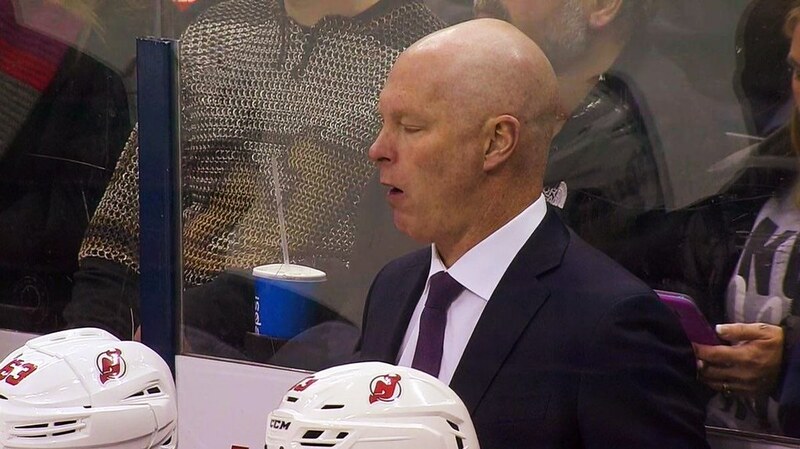 I would love one of those Devils chainmail jerseys. I would guess that, if even sold, they’d be no less than a few hundred dollars though. Aren’t “real” jerseys also a few hundred dollars? Hockey? $250 for a customized Adidas Authentic. NFL? $350 for a Nike Vapor customized. MLB? $300+ for Authentic customized. Will Ottavino wear 0 for Yankees? Or, could he wear 00 to represent the first and last letters of his name? That number wasn’t available in Colorado, as it has been in use by Dinger the mascot. I enjoyed reading Kevin’s story. I was reminded of the garbage trucks I saw when I was in New Orleans a few years ago.